Nina Lehtonen, Sandvik Mining & Construction Oy. With hundreds of variables to consider, creating the best extraction system is a mind-bogglingly complicated affair. Fortunately a quarry modeling service can help design the optimal solution. Quarrying is easy isn't it ­ all you have to do is break out the rock and claim the money? Unfortunately life is not that simple. The reality is that there are literally hundreds of production variables to consider ­ all of which have an impact on the profitability (or loss) of the whole operation. How best to lay out the site? How to drill? How to blast? Type and position of crushers? Loading by excavator or wheel loader? Hauling by rigid/articulated hauler or conveyor? Added to these are business factors such as customer requirements, profitability targets and investment budgets. With so many things to consider it is little wonder that many quarries are designed in a less than perfect way. And while quarry managers realise their operations are sub-optimal, they often do not have the time or resources to change it. Fortunately, a combination of computing power and Sandvik Mining and Construction's years of quarrying experience has been distilled into an analysis service that uses a mine simulation tool called SimQuarry. 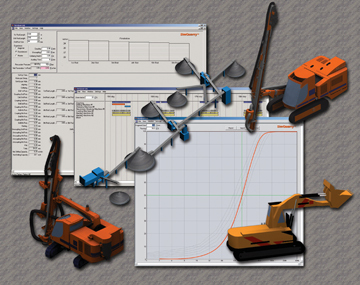 SimQuarry is different from many computer simulation systems on the market in that it has been built using many years of research data from real life quarries around the world. "There are 20 years of practical knowledge converted into the SimQuarry solution," says Pasi Järvenpää, who heads the surface drilling division's quality and production department. The information has been gathered from Sandvik's experts in drilling, crushing, breaking, conveying and tool choice. SimQuarry does not concentrate on the areas of the quarry operation where Sandvik Tamrock's own product range dominates, but takes a holistic approach, analyzing the various stages as a complete system. "We can see the whole process from beginning to end," believes Mr. Järvenpää. "Simulation programs such as SimQuarry allow our experts in the field to create a more efficient supply chain through the whole operation." 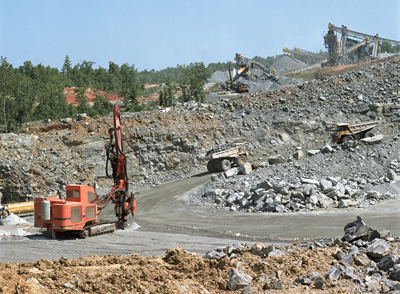 By analyzing the process from the rock face to finished product SimQuarry can identify production bottlenecks. With over 100 variables available the software can identify the true cost of drilling, blasting, breaking, loading and hauling. This data is invaluable in identifying where the money is being spent. And by knowing this, areas for cost savings become readily apparent. It is not just the mechanical processes that SimQuarry highlights ­ even easily overlooked aspects such as landscaping, safety, management and control can be factored into the analysis. Customers often do not know where all their costs lie ­ SimQuarry helps make it simple. Although SimQuarry can process the information almost in real time, the quality of the results generated is dependant on the quality of the inputted data. This can not only take the Sandvik representative several days, it is dependant on the cooperation and participation of the quarry's management. Amassing the data (mapping the site, machines types, haul lengths, gradient, fragmentation sizes etc.) is an arduous process ­ but vital if the resulting information is to be truly useful. And even then it only produces the picture of how the quarry is operating today ­ not how it could operate. Whether the point of the process is to improve the current situation or conceive how it could look, by understanding the quarry as a single system, it is relatively easy to identify the critical points of the process (which need optimizing), and those non-critical areas (that can be sub-optimized), where cost savings lie. The program can even calculate the size of the expected cost savings. What the service can offer is not just a blueprint for a better layout of the site; it also examines cost savings of a more environmental nature ­ such as reducing fuel cost by having shorter haul distances ­ or reducing waste material by correct fragmentation via improved drill/blast systems. A lot depends on what the customers' requirements are ­ is maximum production the aim or lowest cost? It also depends on what resources the quarry has to make improvements. When all the information is inputted, and the customer's priorities factored in, the program helps determine any weak areas in the production chain, prompting questions such as: are all existing machines best suited to the task? It is often the case that several machine types and sizes can do the job ­ but which are the best ones? Choosing sub-optimal equipment can mean the difference between profit and loss. But the SimQuarry consultancy service is not a Sandvik selling tool: it is more about improving relationships over a longer term. Having a good product is merely a qualifying criterion in today's competitive quarrying industry: providing a high level of support is increasingly what clinches the deal. Long term 'knowledge support' such as the SimQuarry service are increasingly important in the quarrying and mining industry, with equipment producers such as Sandvik taking a greater consultancy role for the customer. "This holistic view of the entire operation shows how keen we are to get fully involved in helping our customers be successful, and not just push more of our products," says Mr. Järvenpää. With the customer's mindset moving from initial costs to equipment and quarry/mine lifetime costs, the ability to accurately map out present and future costs will increasingly be seen as a business imperative.